Residents of a northeast Oklahoma town are turning off the tap and reaching for bottled water after some unwelcome visitors decided to take a dip in the city’s filtering system: Little red worms have been found in the filtering system. As such, city officials are asking citizens not to drink the water or use it for cooking while the problem gets sorted out. The worms range in length from a half-inch to an inch long, reports the Associated Press, and were found wiggling about in the drinking water supply this week. The water was temporarily turned off until yesterday, while workers cleaned, drained and then re-cleaned the water tower. “We are still looking into this problem. I mean we need to get to the bottom of it and we will continue to investigate and do pretty much what we need to do to find out what happened here,” said a city councilman. In the meantime, unless residents want a mouthful of worm surprise, residents are being warned not to use the water for anything that would go past your lips. This kind of worm activity is common in the southeastern United States, said a spokeswoman for the Oklahoma Department of Environmental Quality, but it’s a bit odd to have it happening in Oklahoma. 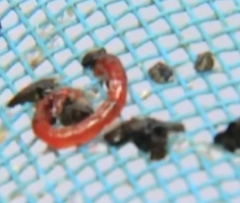 Red worms are annoying, but don’t pose any health risks, say experts. Unless you freak out in the middle of swigging a glass full of worms and start choking in disgust. That could be dangerous.